Mr. Eddy Vino is a Research Professor in Universidad Mayor de San Andres and a Lecturer Professor in Universidad Privada Boliviana. He carried out his undergraduate studies at Universidad Mayor de San Andres obtaining the title of Electronics Engineer with concentration in Telecommunications. Then, he obtained the Master of Electrical Engineering with concentration in Telecommunications at Universidad Nacional Autonoma de Mexico. During his studies in Mexico, he got involved in satellite topics, awakening a childhood passion: Space. After building a Telemedicine Prototype for an Educational Satellite to pursue his master degree, he went back to Bolivia in 2013. 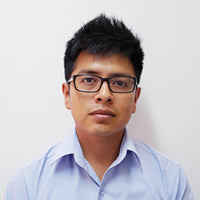 He is currently involved in a collaborative project with the Bolivian Space Agency in Small Satellites and interested in promoting Space Education in his country. His research interests include: On Board computers based on FPGA and ARM, Ground Station development, Nanosatellite sub-system design and development, and Space Education Promotion via Cubesats.